Bananas are the second leading fruit crop in the world. Although traditionally thought of as yellow, bananas can also be red, pink, purple, and black. Originating in Malaysia approximate 4,000 years ago, bananas were introduced to Africa in the Middle Ages by Arabians. After being transported to the Americas by Portuguese explorers in the 15th century, the region became the number one supplier of bananas worldwide. 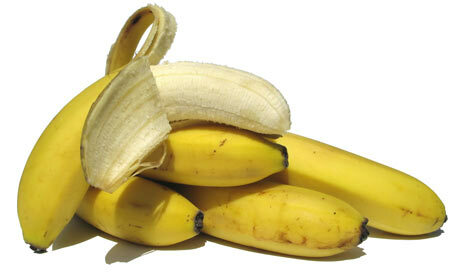 Bananas are an excellent source of potassium, vitamin B6, vitamin C, fiber, riboflavin, magnesium and biotin. Because bananas have lower water content then most fruit, they typically have a higher sugar content, and more calories. A small banana contains approximately 89 calories. Bananas are packed with potassium, an important electrolyte for the body. Potassium helps regulate heart function and fluid balance. Studies have shown bananas to effectively lower blood pressure, protect against heart disease, and prevent strokes. Bananas also aid in soothing the gastrointestinal tract due to their high content of pectin. Bananas are by far one the healthiest on the go snacks around. Their flavor works well in baked goods, and as an addition to any fruit-based dish. What is one of banana’s best flavor complements? Chocolate!